An intervention developed by UCL psychologists significantly increases consumption of fruit and vegetables commonly disliked among picky young children, new research has found. The research, published in the Journal of the Academy of Nutrition and Dietetics, showed that in a randomised controlled trial involving 450 young children, a new method of taste exposure significantly increased the proportion of children willing to try new foods and to continue eating them. In the trial of the method with over 200 families, toddlers showed a 61% increase in their liking of a specific vegetable, and the amount of the vegetable they were willing to eat trebled. A new pack called Tiny Tastes - based on this method - has been developed by UCL in partnership with Weight Concern, a charitable organisation set up by a group of academics and clinicians to combat the epidemic of obesity sweeping the UK by supporting and empowering people to live a healthy lifestyle. Mealtimes can frequently be a battle-ground for many parents, with up to 40 per cent of toddlers becoming picky eaters at some point during childhood, with more than a quarter refusing food every day. In additional, despite the importance of fruit and vegetables in a healthy diet, only 20 per cent of children actually eat the recommended five portions a day, according to the 2010 Health Survey for England. Vegetables are among children's most disliked foods, and vegetable intake consistently falls short of dietary guidelines. Food patterns established in early childhood have been shown to track into adulthood, with the charity urging that increasing children's vegetable intake should be a priority for public health. Patterns of food refusal commonly begin around the age of two. The rejection of foods such as vegetables is widespread and a significant cause of anxiety to parents, with problematic eating patterns a common reason for consulting health professionals. 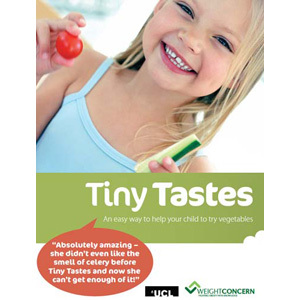 The Tiny Tastes packs were developed for parents by UCL psychologists and Weight Concern to help overcome these challenges by making the introduction of new vegetables into a fun game that both children and parents can enjoy. Tiny Tastes packs include straightforward instructions for parents together with record charts, colouring sheets for kids and fun stickers. The science behind Tiny Tastes builds on research that shows that after tasting a new vegetable at least ten times, children like it more and will eat more of it. The authors found that offering a reward encourages even the pickiest eaters to get involved. Over two weeks the simple process of Tiny Tastes actually increases children's liking for vegetables, making them more willing to try other vegetables. Commenting on the findings, Dr Lucy Cooke, Senior Research Psychologist at the Health Behaviour Research Centre at UCL and author of the research, said: "It's thought by evolutionary psychologists that when humans were cave-dwellers that picky eating would have stopped young, newly mobile children from eating unfamiliar plants or berries which might be poisonous. Knowing this is not much consolation, though, when your child refuses to eat anything green and is living on plain pasta and orange juice!" "Our research shows clearly that a programme of introducing children to unfamiliar foods regularly and over a sustained period will lead to greater familiarity and eventually enjoyment of these foods - so for the best results, it is worth persisting using this structured approach." Dr Laura McGowan, Director of Weight Concern, added: "The advantage of Tiny Tastes is that it provides everything parents need to help overcome what can quickly become a nightmare at mealtimes and a stressful experience for the whole family. "Parents can also be secure in the knowledge that the pack is based on solid scientific research which shows the positive effects it can have on the eating habits of young children - both immediately and for a lifetime."